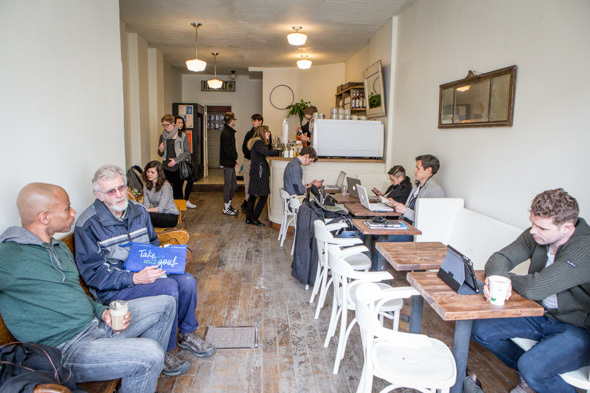 The Common has a new Annex location - at Bloor and Brunswick, a few doors down from By The Way Cafe and just across the street from Future Bakery . 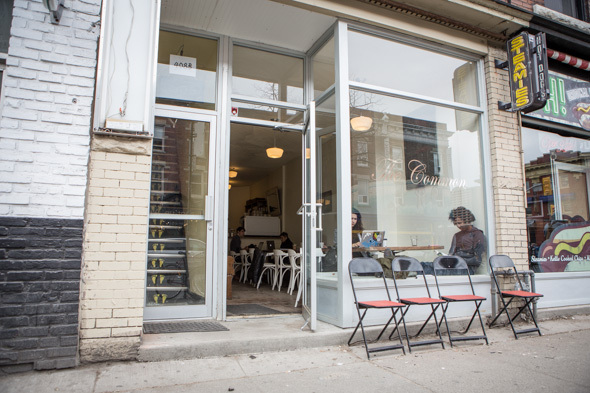 The new cafe, the third location in a chain that includes shops on College and Bloorcourt , might be of a slightly different breed than its neighbours, but the owners still acknowledge they're the new kid on the block. "Obviously, they kind of pioneered that strip," says Common owner Edward Lau. "We're just another option, and I hope it's another option that the neighbourhood can be kind of happy about." 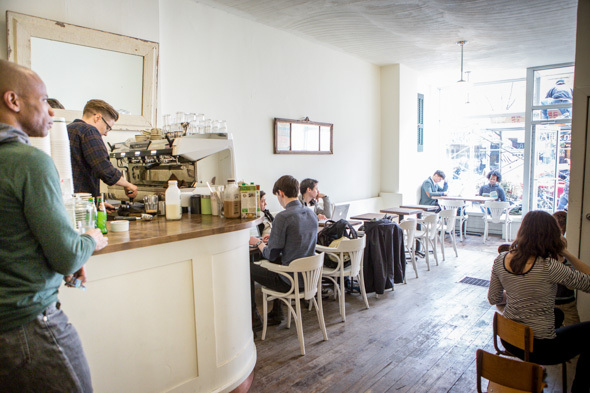 The space is bright and sunny, with white walls, white-painted chairs and pale wood floors, and perpetually bustling with grab-and-go visitors as well as the usual laptop-toting daytime crowd. 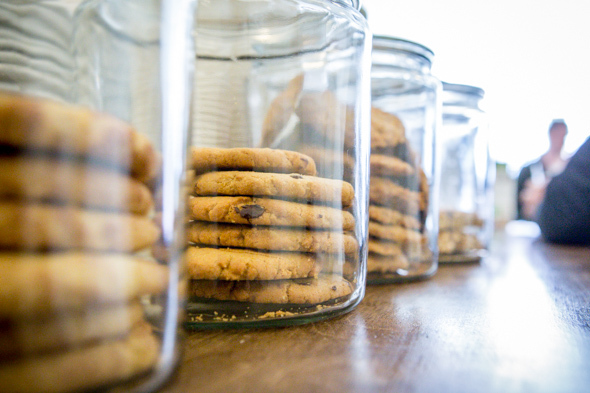 The lineup of drinks and snacks is small and simple - classic espresso drinks, tea, and a few baked snacks in glass jars along the counter. Among them: Coconut cookies ($1.50) and crunchy, not-too-sweet shortbreads (a very reasonable $1), baked daily by Lau's dad. 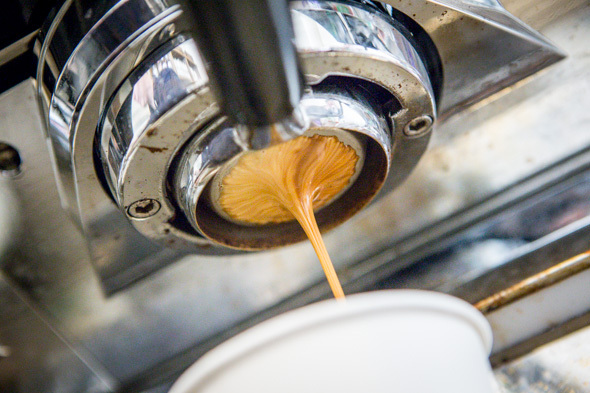 Espresso drinks, including their much-vaunted $2 americano, use Rufino and Mountain View beans. 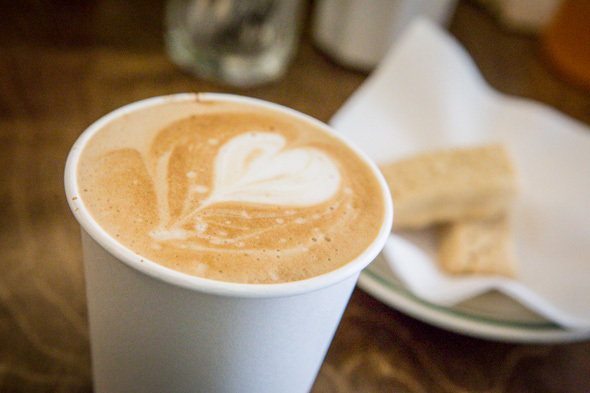 In keeping with their aim to focus on organic products, they use Harmony organic unhomogenized milk, which makes for one of the most ridiculously decadent lattes ($3.50) I've had in ages. They've got chocolate for mochas, too, if you're so inclined. In keeping with Common tradition, none of these prices are listed anywhere in the shop - you have to ask your barista what's available and how much they're asking. 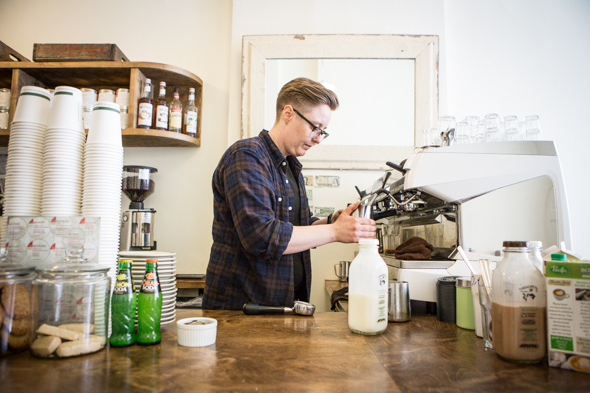 "There's a very conscious decision not to have a menu," Lau says. "It's all supposed to get people speaking to each other, and interacting." In there other locations, he adds, that carries through to communal tables in the decor. "Just looking back, nine, going on 10 years at the College Common, I just think about all the people who have come together and met each other. It's just a nice way to get people talking."